(Newser) – Want a baby but not able to conceive biologically? Know how to use Tinder? 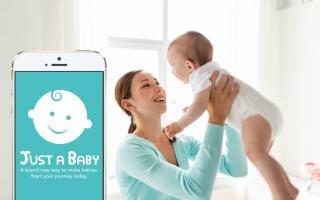 A new app called Just a Baby now lets people browse sperm donors, egg donors, surrogates, co-parents, and even old-fashioned partners as if they're dating online, and it's ruffling a few feathers, per NBC News. "There's no such thing as just a baby," fertility specialist Dr. Aimee Eyvazzadeh says. "When you're dealing with human beings, you're dealing with their extended families, and possible future families, and relationship dynamics get involved." This app, she cautions, is more like "Just A Baby, And Then All The Possible Complications That Could Go With It." As if an app for finding a match wasn't enough, we now have an app for finding probable biological fathers and mothers for infertile couples. Don't know how successful it will be. Are these eggs to cook? I just had to ride the bicycle to get some. Needed milk too so that on the handlebars and me 220 lbs uphill is a challenge. Delivery please!